A good occasion to observe novelties on the market is the Amsterdam’s METS, the world’s greatest boating equipment fair. On the 2015 METS the Texan anchor manufacturer Mantus presented its latest line of anchors, displaying a showcase video on its stand. Following the old expression that one image is worth more than a thousand words, Mantus representatives compared the features of their latest invention with “standard” anchors available on the market. The video shows a tractor dragging several anchors up a sandy beach. The Mantus anchor digs into the sand much faster and holding stronger than its competitors, even if they are much heavier. Isn’t this more than enough to attract attention? Furthermore, Mantus representatives displayed several “standard” anchors of the same weight, including their own. They tested the pressure under the tip of each anchor by asking the audience to put their fingers under each one of them. The Mantus anchor showed greater pressure than other anchors. One may conclude that the secret of the Mantus anchor lies in its innovative construction, not its weight. User reviews claim that Mantus holds better than other anchors even on the rocky seabed. However, there are some unfavourable comments about Mantus as well. 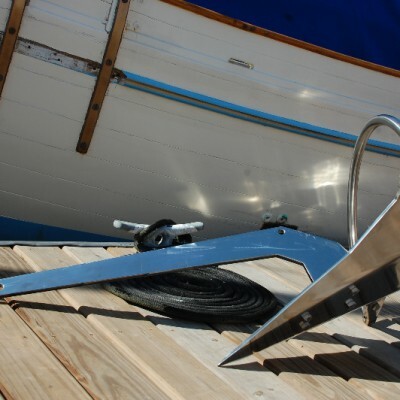 Most of them concern the anchor delivery – Mantus anchors are sold as a kit. You get a wooden box with three parts and some bolts. This may seem as a joke, but it’s true. Before you can use the anchor, you have to connect the plough to the branch with four bolts and the half-circled handle with two additional bolts. Once assembled, the anchor can be mounted to the bow like all the other types of the anchor, but if you decide to use Mantus as a spare anchor, then the kit does not look like such a bad idea at all. It is very easy to assemble and can be safely stored in a small box when not in use. Good anchor but china stuff.